Federica Schiavo Gallery is pleased to present And These Crystals Are Just like Globes of Light, the third solo show by Salvatore Arancio at the gallery. The artist’s aim, through the use of a range of media such as ceramics, collage, prints and video, is to give the sensation of a compact and homogeneous concept regardless of the fact that his practice is paradoxically composed of contrasting elements. Each facet of his practice contains an intertwining juxtaposition of the roots and representation of images: natural and artificial, mineral and vegetable, two-dimensional and three-dimensional, scientific and mythological. Departing from their literal meaning, Arancio creates new juxtapositions that are both beautifully evocative and deeply disquieting. 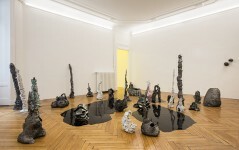 The display of the first room revolves around a sculptural installation designed and produced by the artist for the Kunsthalle Winterthur in 2016. The leitmotif for this part of the exhibition is the fictional reading of the Cave of Giant Crystals (Cueva de los Cristales), the caverns located below the Naica Mine in Mexico, where there are the biggest natural crystals known on Earth. The cave inspired Arancio to an installation of individual ceramic works arranged on black resin surfaces and titled And These Crystals Are Just like Globes of Light. While the Cave Of Giant Crystals became the source of inspiration for the works in the first room, in the next one the sculptural pieces are shaped by forms informed by the petrified trees of the “Lava Trees State Park” in the Hawaii Island, that preserves lava moulds of the tree trunks that were formed after a volcanic eruption in 1790. 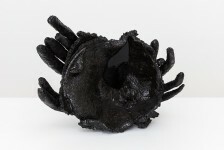 By using a natural material like clay to recreate the lava trees’ totemic presence and by toning the resulting shapes with iridescent, metallic glazes, the artist’s aim is to create a link to his on going fascination about nature as a theatre for rituals, worships and self-induced trance states. The sculptures in the second room have been produced in 2017 in collaboration with the ancient Ceramica Gatti in Faenza together with the project for La Biennale di Venezia 2017. 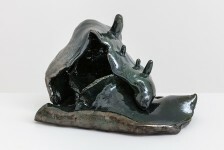 In all the sculptures in the show, Arancio doesn’t hesitate to convene science and make apparent their mystical side decontextualizing the forms that have inspired him and emphasize the strangeness and the evocative power of these natural elements that may recall phallic symbols and esoteric signs. A “strange temporality” will emerge by visiting the show, where you’re not exactly sure where you might be, or when.